Federal Reserve Chairman Ben S. Bernanke acknowledged Wednesday that the government’s bulging deficits are reaching levels that are unsustainable in the long run, but he said substantial action to reduce them was probably at least two years away. The embryonic recovery from the worst economic crisis in more than half a century, especially the nation’s weak job market, is much too fragile to begin cutting back on government support any time soon, he said….”I’m not advocating, I don’t think anyone’s really advocating trying to balance the budget this year or next year,” he said in delivering the Fed’s semiannual report to Congress in front of members of the House Financial Services Committee. Of course, there’s another difference between the two accounts as well. 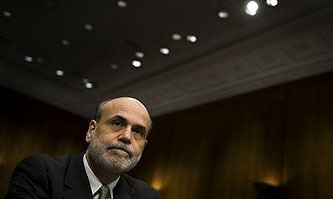 Later in its piece, the LA Times does report that Bernanke also has long-term deficit concerns. They tell the whole story. Later in its story, the Washington Times…..reports that Alan Greenspan is concerned about deficits too. You can read their entire 1000-word account and never have any idea the Bernanke thinks big federal deficits are just fine for the next couple of years. Nice job.